DAISY Award honorees personify Fort Duncan Regional Medical Center's remarkable patient experience. These nurses consistently demonstrate excellence through their clinical expertise and extraordinary compassionate care, and they are recognized as outstanding role models in our nursing community. Patients, visitors, nurses, physicians or employees may nominate a deserving nurse. 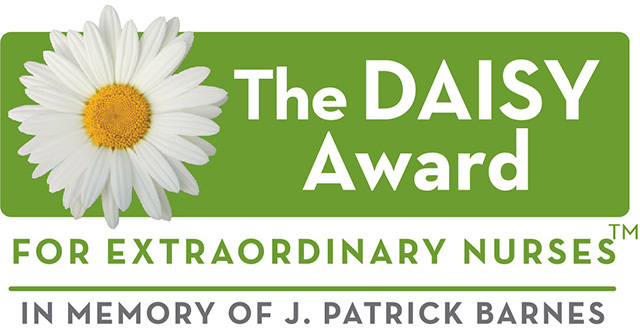 The DAISY Award is a program that rewards and celebrates the extraordinary clinical skill and compassionate care given by nurses every day. Fort Duncan Regional Medical Center is proud to be a DAISY Award Hospital Partner, recognizing one of our nurses with this special honor every month or quarter. To find out more about the program, including the growing list of Hospital Partners. The DAISY Foundation was established in 2000 by the family of J. Patrick Barnes who died of complications of the auto-immune disease Idiopathic Thrombocytopenia Purpura (ITP) at the age of 33. (DAISY is an acronym for diseases attacking the immune system.) During Pat's eight-week hospitalization, his family was awestruck by the care and compassion his nurses provided not only to Pat but to everyone in his family. So one of the goals they set in creating a Foundation in Pat's memory was to recognize extraordinary nurses everywhere who make an enormous difference in the lives of so many people by the super-human work they do every day. Thank you so much for your very warm welcome and the opportunity to visit with your nurses and you. We are so proud to partner with you, and now that we've been with you, we are even more excited about our partnership. Our profound gratitude for all you are doing to make DAISY so meaningful. Clearly, your Honorees are the epitome of what DAISY was created to celebrate, and it is wonderful to see your nurses are getting all we hoped they would from the program. None of this would be the case without the dedication and creativity you and your team put into making DAISY so special. Thank you for your continued support! We look forward to seeing you again.